The same storm that made Saturday’s NFL playoff game between the Seattle Seahawks and the New Orleans Saints such a sloppy affair and dumped 18 inches of new snow on the Summit at Snoqualimie ski area just east of Seattle finally slammed into Colorado Sunday morning. 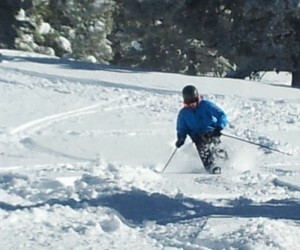 Nick Williams carves up 10 inches of fresh snow in Vail’s Montagne Glade on Saturday (David O. Williams photo). High winds hit Eagle at about 8 a.m., accompanied by driving snow that’s expected to drop another 6 to 12 inches of snow on Vail and Beaver Creek by Monday morning. The downside? Peyton Manning may face some challenging winds during Sunday’s playoff game between the Denver Broncos and the San Diego Chargers in Denver. The upside? Amazing skiing and snowboarding in northern and central Colorado. Vail has already enjoyed a stellar start to the New Year with about 3 feet of new snow over the last week or so. Snow riders on Saturday feasted on 10 inches of new snow (most of it overnight) and about 21 inches of new snow since Wednesday night. “A quick 3-6 inches of snow will fall on Sunday as the cold front moves from north to south across the state,” Gratz wrote Sunday morning. “Behind the front, snow showers will continue Sunday afternoon through midday Monday with an additional 3-6+ inches along and north of I-70.